An Elephant back safari in Knysna is a Garden Route highlight for young and old alike who will also enjoy feeding and touching these magnificent creatures. Here you can get married in style, meet, feed and interact with Elephant, enjoy an Elephant back safari in Knysna, walk alongside them or indulge in sunrise and sunset adventures in magnificent Garden Route scenery. Visitors can relax in the peaceful natural surroundings characterised by pristine forest, Cape Fynbos (wild plants) and mountain views. At Knysna Elephant Park visitors can really be touched by an Elephant and discover how amazing this is – a life changing and spiritual experience. Young children will be delighted to feed and get close to these gentle giants on the daily tour while an Elephant back safari in Knysna or leisurely walks are longer and more active. The sunrise and sunset safaris and sundowners offer intimate and private interactions. Elephant interaction is a special feature and the bride can make her entrance on one for a unique and unforgettable African wedding. The lovely Chapel and reception venue (Lapa) is located at the edge of an indigenous forest. Knysna Elephant Park has an experienced team available to assist with all the arrangements. The Lapa has an open plan design with natural finishes and accommodates 110 people. There is a large deck with sweeping views of the Outeniqua and Tsitsikamma Mountains. Menus are flexible and exciting and can be tailor-made to suit requirements and there is an equipped kitchen on-site. The Lapa has wonderful views and is ideal for any kind of gathering or celebration, seating up to 120 people comfortably. This stylish venue has a great deck with rustic finishes. It adapts well to small corporate or personal touches which can be added with ease. Self-catering facilities are available on-site at beautiful Elephant Lodge. Includes an informative video and then time to touch, feed and interact with the Elephant without fences or barriers. After a briefing, guests ride the Elephant through the indigenous Fynbos and then return for refreshments to the Lapa. A gentle guided nature walk at Elephant pace through the beautiful surroundings followed by refreshments on return to the Lapa. A group of guests (minimum of 10 and maximum of 50) can feed and interact with the Elephant in the evening and enjoy snacks and drinks while the sun sets. 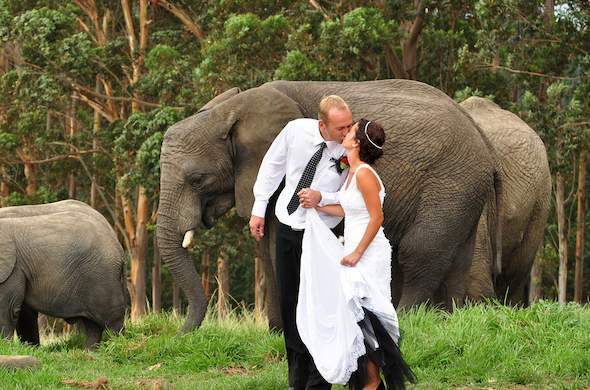 Celebrate your special wedding in a uniquely African style at the Knysna Elephant Park in the Garden Route. Make an unforgettable entrance on Elephant back surrounded by the Outeniqua Mountains. An Elephant Back Ride is an unforgettable journey. Explore this Garden Route park along old Elephant trails, traversing through the indigenous Fynbos.